Left: Home to MoonDance's annual Summer kids' camp, Earth Dance, O.U.R. Ecovillage is a hub of creative community building and environmental stewardship. 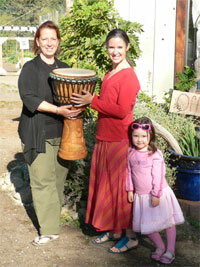 From an idea generated by Kata, one of our Camp leaders in '08, MoonDance and Kata partnered to donate a drum to the Community at the Ecovillage. A small gesture compared to the gifts the Ecovillage gives to our local community, and beyond! "How grateful I am for MoonDance! I come in to the studio after a long day feeling drained and heavy, but it is never long before renewal and a sense of community erupt from dancing and drumming together. Inevitably, my whole self fills up, until i am almost bursting. What's even more is that when i walk home after all this i feel like a new creature... alive and alert again! Thank you for sharing yourselves, your talents, your love and wisdom with us everytime!" 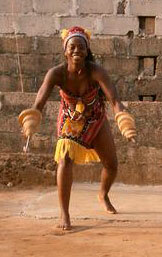 In December 08 / January 09, a group of 10 "MoonDancers" embarked on a journey to Conakry, which included drumming and dance (of course!) most of the day, as well as time spent helping build the school in Kubian, and personally delivering funds raised in Canada (see below), as well as other service work. Please check back here, as well as www.balletsaamato.blogspot.com and www.Matoto.org, for photos and stories. We have two Sun Ovens that we will personally deliver to our "family" in Conakry as a pilot project. Deforestation and pollution from cooking fires are serious problems. Globally, one third of humanity, over 2.4 billion people, depends on wood and charcoal to prepare food. Add to that the demands of massive population growth and the inefficient conversion of wood to charcoal. In Guinea women are primarily responsible for food preparation, and over time their health (and that of the children in their care) is severely impacted by the smoke (respiratory infections; asthma; lung cancer, etc.). Also, as deforestation creeps on, women are forced to travel farther each day to gather wood. This exposes them to greater safety risks, as well as taking up time that could be for more productive activities. This is our pilot project: hopefully the sun oven will work out well for them, and we can send MANY MORE! See www.SunOven.com for more information. We offset 59,000 lbs of carbon, the estimated amount of all of our flights, through Terra Pass. All of their projects are based in North America and one of three types: clean energy (wind), farm power (manure), and landfill gas capture. Matoto Multicultural Arts Society is now in its infancy. New developments will be posted as they arise. We have nearly met our goal of $6000 for the new school to be built in Kubian (where currently no school exists). $1500 has been sent in advance for the project to begin, and we will jump in when we arrive. The school and the building thereof is being entirely administered from within Guinea, and they are the full decision makers. Our only "two cents" is that included in the curriculum, there be elements of traditional Arts and some instruction taking place in traditional languages (not only French). Education is key in all areas: health, politics & governance, sustainability... It is with great reverence that we offer this gift. And with enormous gratitude to all the generous supporters.